Feryal Abbasi-Ghnaim was born in Safad, a northern city in Palestine. During the 1947-48 war, her and her family fled Palestine for refuge with the intention of returning after the war was over. 1948 not only commemorates the creation of the State of Israel, but also the destruction of Palestinian society known as as al-Nakba, or “Catastrophe”. Since Palestinians were not Jewish, their presence and predominant ownership of the land were obstacles to the creation of the Jewish state. Forced into exodus by Israeli troops, at least 750,000 Palestinian men, women, and children fled or were forced into exile. Of these Palestinian (also known as al-Nakba refugees) was Mrs. Abbasi-Ghnaim, her mother, father, two sisters and one brother. The Abbasi family first fled to Damascus after fleeing the war in Palestine. Then, when Mrs. Abbasi-Ghnaim’s father became employed as a school principal, the family moved up to Manbej, a town in Northern Syria near Aleppo. In 1952, her family moved to Irbid, Jordan where she resided until 1968. In 1965, as a teenager, Mrs. Abbasi-Ghnaim began her career in teaching through the United Nations Relief Works Agency (UNRWA) at the Irbid Palestinian refugee camp. She taught elementary and middle school students general arts and crafts, as well as Palestinian embroidery and drawing. There was no set curriculum at the UNRWA schools, so Mrs. Abbasi-Ghnaim had the flexibility to adapt to each student’s artistic needs and creative development. She quickly became acknowledged for her leadership in the art department, creating an art curriculum where no precedence was set. The UNRWA school superintendent recognized her leadership and implemented her art curriculum in the Damascus region for all UNRWA schools. As head of UNRWA art department for all refugee camp schools in the region, she not only was tasked by the superintendent to set the curriculum — but conducted teacher training programs for all newly recruited art teachers. She most notably organized the UNRWA Arab artist conference in Damascus, an honorable post on behalf of the United Nations. Mrs. Abbasi-Ghnaim speaks very fondly of her time at UNRWA and the ranks she climbed as a career-driven woman in her time. Despite the hardships she faced being a woman and a Palestinian refugee, she established herself in what she loved the most — preserving the art and culture of Palestine and the Palestinians. Yarmouk Refugee Camp, Damascus, Syria; circa 1970. Mrs. Abbasi-Ghnaim’s father tragically passed away in 1966 in Irbid, Jordan. Immediately after, her mother and siblings moved back to Damascus, Syria. She was not granted transfer to teach at UNRWA schools in Damascus until 1968, where she then followed to be with her family and continue her career as head of the art department. She ambitiously completed her university degree Damascus University in art and history in 1975 while working full-time at the UNRWA refugee camp school. 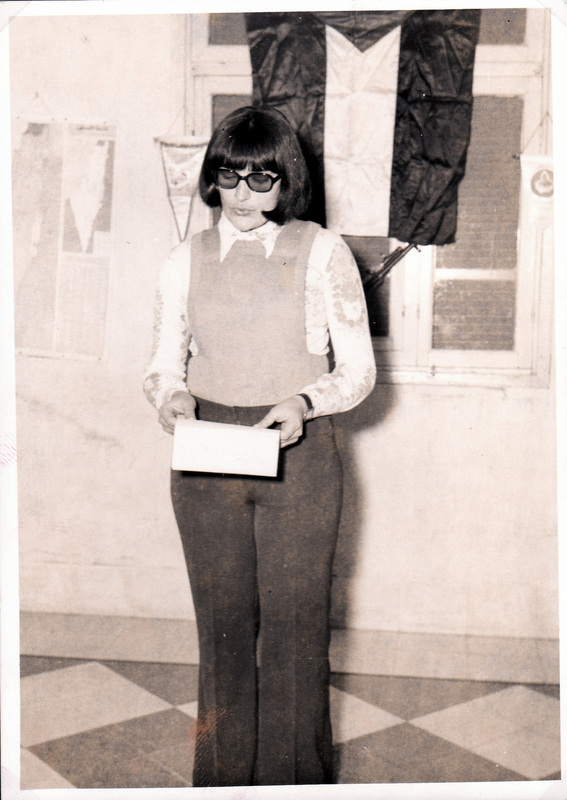 Mrs. Abbasi-Ghnaim taught at UNRWA for 12 years before she left to Amman, Jordan in 1977. Mrs. Abbasi-Ghnaim was known and remembered in the region for being instrumental in the growth of the art curriculum and faculty at UNRWA schools in Syria and Jordan, even more so, as a very skilled, creative and flawless embroiderer & folk artist. One of Mrs. Abbasi-Ghnaim’s most prized accomplishments is designing the logo for UNESCO’s Palestinian heritage encyclopedia series in 1973. Of course this series is not available online, and can only be found in the UNESCO 1960’s archives, which her daughter, Wafa, is ambitiously attempting to locate. After returning to Jordan, Mrs. Abbasi-Ghnaim decided to leave the United Nations and pursue her career in the private sector. That is when she met her husband, Mohammad. They were both working at the Royal Jordanian airline, him in the acquisitions department and her in revenue. It was love at first sight. After marriage, her and Mohammad immigrated to the United States in 1980. She had three daughters, Fida, Wafa and Safa, who were her happy, little craft assistants that accompanied her in her exhibitions, speeches, lectures and festivals that promote Palestinian cultural traditions, folk art and oral history. She became quickly recognized as an expert in her field, and recruited to work with the Executive Director, Cindy Cohen, at The Oral History Center of Cambridge. In 1985, she co-managed a series of workshops titled “Stories in Fabric” with Ms. Cohen. This project was a follow up to the Cambridge Women’s Quilt Project, focused on tapestries of women of color documenting their struggles and depicting their personal stories. In addition to managing the interviews, exhibition and project, Mrs. Abbasi-Ghnaim’s traditional fabric and fiber artwork was featured in an exhibit containing her tapestries, excerpting interviews and photographs of her work. In 1985, the project was brought to the International Women’s Conference in Nairobi, Kenya. Mrs. Abbasi-Ghnaim’s work on the project was honored, and her art was showcased. 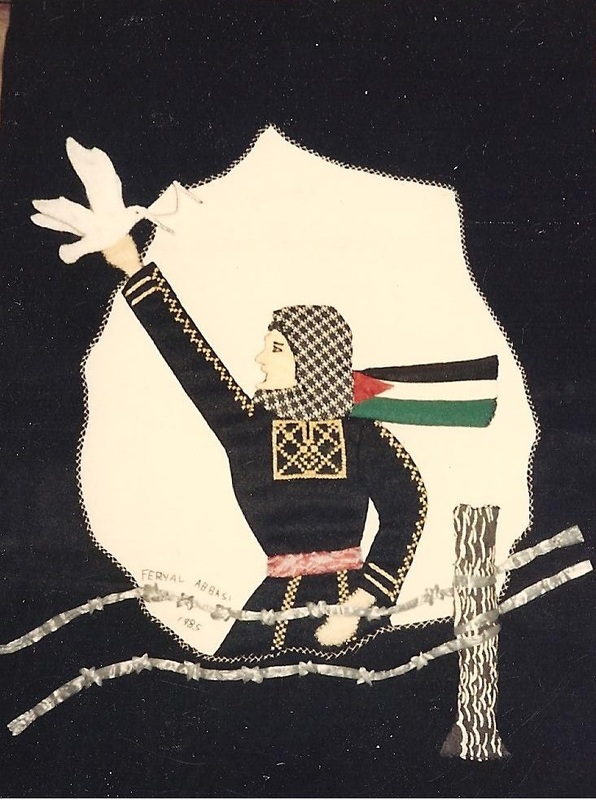 Most notably, she shared her tapestry “Dove of Peace” or “حمامة السلام” at opening ceremony, which contained her most renown speech sharing the struggles in preserving her cultural identity as an immigrant in the United States. This speech is read in all of Mrs. Abbasi-Ghnaim’s lectures, and is written in English & Arabic — folded and tucked away in the envelope carried by the dove. Her moving speech can be seen here. Her work at the Oral History Center of Cambridge continued into an oral history interview project titled “A Passon For Life: Stories and Folk Arts of Palestinian and Jewish Women” during July 1988 through May 1990. This project consisted of oral history interviews with eight Jewish and Palestinian women, including Mrs. Abbasi-Ghnaim, living in Boston, whose lives involved some type of folk art tradition. Mrs. Abbasi-Ghnaim served as the project’s co-lead with Ms. Cohen. They worked together to help the women, from cultures of long-standing conflict, find a common bond without hiding the fact that they had important differences. The project asked; What is involved in learning to communicate respectfully across differences in power? Can we create modes of expression which are themselves healing and which peace and justice more likely? How can we nourish ourselves and in others the capacity to listen to the story of the other and to simultaneously hold in view two (or more) conflicting and competing narratives? “A Passion For Life” was as successful as it was controversial, exhibited extensively to the public over the next decade as well as presented in 18 public events. Gold embroidery on a traditional Palestinian garment. 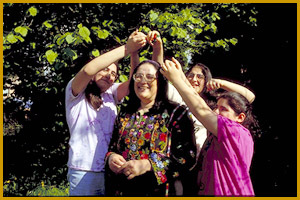 Mrs. Abbasi-Ghnaim was a peace activist as much as she was an artist. Over her nearly 50 years of folkloric and artistic expertise, she has lectured at notable institutions about Palestinian traditions including the University of Massachusetts, the Oral History Center of Cambridge, Portland State University, University of Oregon, to name a few. In 2005, she was a featured artist and teacher in the Immigrant Refugee Community Organization’s (IRCO) program titled “Creating Access for Refugee and Immigrant Artists (CARITA). In 2009, she worked collaboratively with the World Affairs Council of Oregon and the Middle East Studies Center, participating in the “Teach the Middle East” forum with workshops designed for youth, and training K-12 educators about Middle East culture, as well as humanitarian and art education. Ms. Abbasi-Ghnaim was also involved in the World Beats Festival (2007, 2009, 2011), Keynote Speaker for cultural events hosted by the Americans United for Palestinian Human Rights (since 2010), World Animal Festival at the Oregon Zoo (2010) and the annual Arab American Cultural Center of Oregon’s Arab Festival (2009 – current). In 1997, Mrs. Abbasi-Ghnaim was named a Master of Ceremony in the exhibit “Traditional Artists and Life’s Passages” by the Oregon Historical Society. She maintains involvement with numerous arts education grant programs through the Oregon Historical Society and Oregon Folklife Network since 1990 when she moved to Oregon. 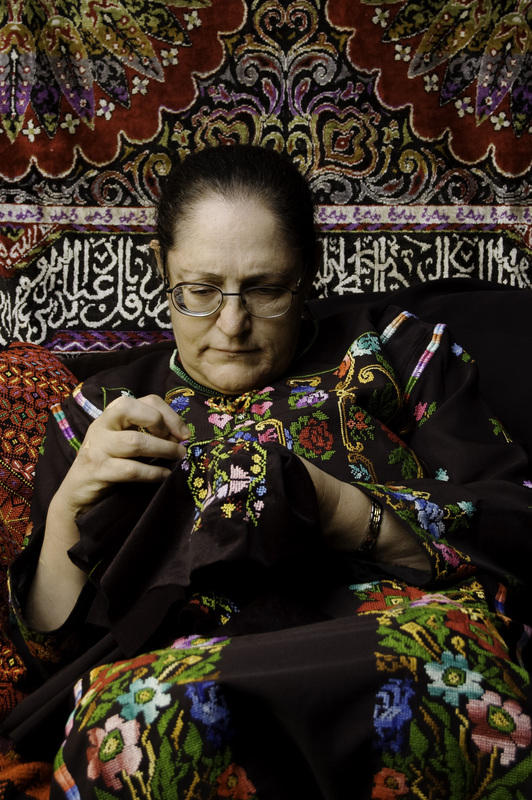 Mrs. Abbasi-Ghnaim has dedicated her life’s work to teaching young women of color the traditional art of Palestinian embroidery and fabric art. She still leads workshops and classes at all educational levels in public schools in Beaverton, Milwaukie, Gresham, and Portland. and is a four-time grant recipient of the Traditional Arts Apprenticeship Program through the Oregon Folklife Network. Mrs. Abbasi-Ghnaim has been recognized several times as a Master of Traditional Arts and Culture Keeper for the Oregon Folklife Network’s (OFN) Traditional Arts Apprenticeship Program (TAAP). TAAP is supported in part with funding from the Oregon Arts Commission, the National Endowment for the Arts, the Oregon Historical Society, and the University of Oregon. OFN has also recognized her artistry with inclusion in the Oregon Culture Keeper’s Roster. She is currently working on a book project with her daughter, Wafa Ghnaim, titled Tatreez & Tea which is set to be published by June 30, 2018. To learn more, please visit http://www.tatreezandtea.com. In 2018, Feryal was awarded the National Endowment of the Arts (NEA) National Heritage Fellowship for her artistic excellence and contributions to Palestinian embroidery education in the United States. This lifetime achievement award is a prestigious honor that recognizes the nation’s master folk and traditional artists, and is only given to an artist once in their lifetime. Feryal is the first Palestinian woman to earn this pinnacle career achievement as an NEA National Heritage Fellow in the 35-year history of the award. Biography and chronology compiled and written by Wafa Ghnaim.